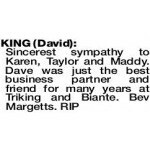 KING DAVID 10.10.1960 to 23.3.2019 The best Husband and Dad ever. We miss everything about you and will continue to love you everyday. You have left a hole in our life that no one else can fill. 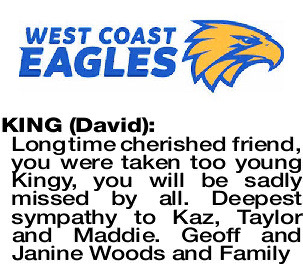 The Funeral Cortege for Mr David King of Sorrento will arrive at the main entrance of PINNAROO Valley Memorial Park, Whitfords Ave, Padbury at 10.00am on MONDAY (1.04.2019) for a Cremation Service. 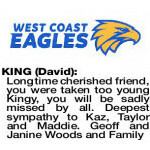 KING DAVID We can't believe you are gone, we are so hollow inside. 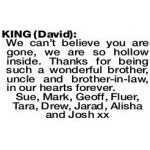 Thanks for being such a wonderful brother, uncle and brother-in-law, in our hearts forever. 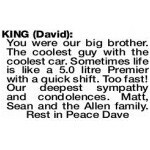 KING DAVID Oh Kingy, that blue Holden Premier, those blue boggart jeans, the nights at the Herdys, Overflow and Gobbles, college life, footy and that cheeky smile. How could I forget those best times in my life. Recent years we may have been apart but you were always in my heart. 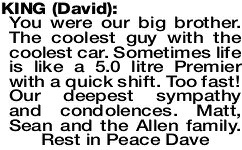 The best bloke I ever met and when we did catch up it was like I saw you yesterday. You had my respect and love I only give to a select few and a bond that could never be broken over time. 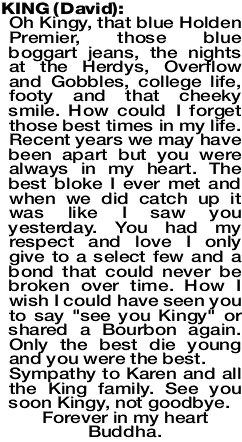 How I wish I could have seen you to say "see you Kingy" or shared a Bourbon again. Only the best die young and you were the best. 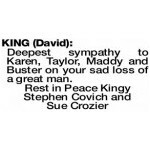 Sympathy to Karen and all the King family. See you soon Kingy, not goodbye. 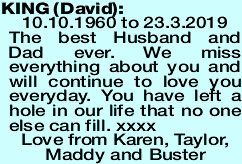 Deepest sympathy to Karen, Taylor, Maddy and Buster on your sad loss of a great man. 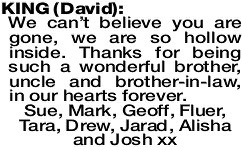 You were our big brother. The coolest guy with the coolest car. Sometimes life is like a 5.0 litre Premier with a quick shift. Too fast!